Resource speaker Ms. Ninfa Ilumida B. Quirante, Officer in Charge (OIC) of Public Information Agency (PIA), Eastern Samar Provincial Information Office gives some refresher course on news writing to DPWH public IOs through workshop. 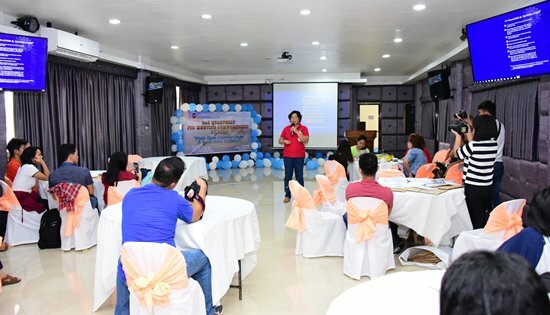 NAVAL, Biliran – The Public Information Officers (IOs) of Biliran District Engineering Office (DEO) are seriously taking up the challenge of fighting fake news. Public IOs Ms. Chelsea Q. Salloman, Engr. Gene F. Delfin, and Mr. Penny Lloyd E. Batoto attend Workshop under Communication Development Program (CommDev) of the Department of Public Works and Highways (DPWH) on June 7-8, 2018. The workshop was held during the 2nd Quarterly Meeting of DPWH Region VIII Public IOs at Eastern Samar District Engineering Office (ESDEO), Borongan City, Eastern Samar. According to District Engineer (DE) Manolo A. Rojas of ESDEO, the DPWH has been allocated by the government with the biggest budget this year. “With great power comes great responsibility,” DE Rojas said quoting the fictional character Spiderman. “This is the reason why all eyes are focusing on our performances,” he added during his welcome remarks to public IOs. “Because of the technology and accessible social media, a lot of information are now displayed on the internet and everything is only one click away, fake news is very rampant,” he said. According to DE Rojas, the public has to know the good news on what the DPWH is doing, that they deserve to know the truth and that they are privileged. “That is now the work of Public Information Officers, and that is also the reason why you are important,” DE Rojas said. “You are the voice of the department, you are the warrior of fake news, and you are the communicator of good news,” he added. Fake news/ disinformation is an information that is false, and the person disseminating it knows it is not true, therefore it is an intentional lie. Resource speaker, Ms. Ninfa Ilumida B. Quirante, Officer in Charge (OIC) of Public Information Agency (PIA), Eastern Samar Provincial Information Office gives some refresher course on news writing to DPWH public IOs through workshop. In fighting fake news, public IOs of Biliran DEO together with other district IOs of DPWH pledged to write only what is the truth, what is verifiable, and what is accurate and timely.